Is this study the bane of crypto-zoologists? We often hear about species going extinct or supposedly extinct species popping up in the wild again. It's a big world. How do we determine whether a species is really and truly gone for good? Two scientists have studied the matter. And they pretty much have shown why Bigfoot won't be turning up. Cryptozoologists looking for the Loch Ness monster or a Yeti sometimes cite the successes of past much-maligned zoologists. The platypus was considered a fake. 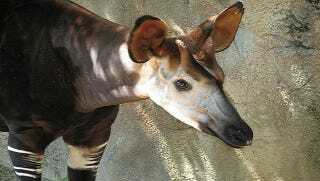 The idea that the okapi existed was scoffed at for some time before expeditions found them in the forests of what is now the Democratic Republic of the Congo. Something might always turn up! And its true. Some things might. Especially if it disappeared in the first place because of habitat reduction. A study published in the Proceedings of the Royal Society B noted that animals considered extinct because of habitat destruction are likely to be miss-classified. A surprising amount of them turn up again. Species might be more resilient than we think. Or they might just be more widespread. A species is classified as extinct when no one has seen it for fifty years or after an exhaustive, extensive search has yielded nothing. Since both the exhaustive search and the casual animal enthusiasts will concentrate on areas already known to contain the species, the animals in outlying or unusual areas aren't likely to be spotted. But what about species that haven't been discovered at all? What about the ones that exist only in legend? How long before we give up? Apparently, after about eleven searches. One or two concentrated efforts don't have much of a chance of finding an animal even if it is out there. The chances of finding the species increase steadily up until about six searches have been made. After that, the odds don't increase. Get to about eleven searches, and you've got a true indication that no one will ever find what you're looking for. It isn't there. How many episodes of Finding Bigfoot have there been? Via Proceedings of the Royal Society B and Wired.